For the 20th year, hundreds of colleagues gathered for the annual UW-Madison Showcase in Union South on Wednesday, March 21, 2018. DoIT Academic Technology team members from multiple services presented posters with partners from across the campus. 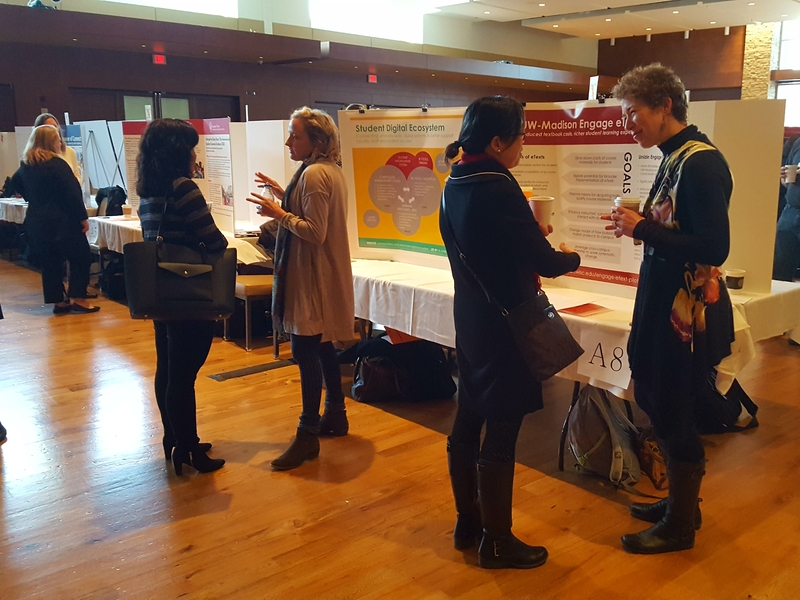 The “Collaborative Partnerships: From Prototype to Production” poster featured the Agefuly App that Teaching & Research Application Development (TRAD) collaborated with the School of Nursing’s Center for Aging Research & Education (CARE) on. Diane Farsetta from CARE joined Stephanie Johnson, Brian Ploeckelman and Justin Janisch from TRAD to explain how their teams used an iterative process with multiple communication touchpoints to ensure the prototype was developed rapidly and incorporated a wide range of feedback. The teams continue to work together on the second pilot for the app that provides evidence-based guidance, support and planning tools to family caregivers of older adults. Also celebrating cross-campus collaboration, the “One Online Application. Countless Pre-College Application” poster tells the story of Information Technology Academy (ITA) and Precollege Enrichment Opportunity Program for Learning Excellence (PEOPLE) piloting a shared online application this spring. The project began when ITA and PEOPLE identified a shared need for an online application system that applicants and administrators could easily navigate while ensuring that data was effectively managed and secure. The Division of Continuing Studies (DCS) offered to adapt their iApply application that would also help prospective students more seamlessly join the UW-Madison community. 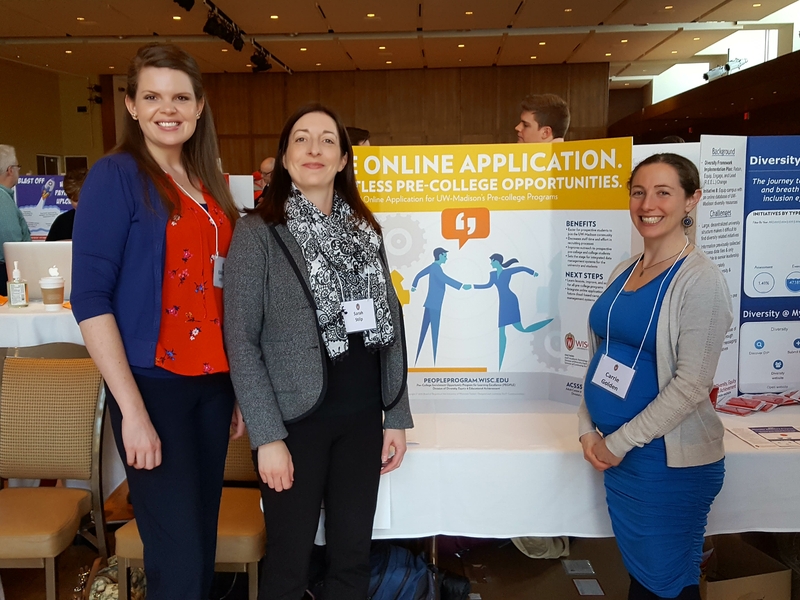 “We were so excited to partner with ITA and PEOPLE on the application project because of the potential benefits for other precollege programs around campus,” states Sarah Stilp, Assistant Director of Admissions and Student Services for DCS’s Adult Career & Special Student Services (ACSSS). “It was exciting to be on the leading edge of creating data solutions for such an important group of learners.” Sarah was joined at the Showcase table by Carrie Golden from ITA, Tena Madison from Division of Diversity, Equity & Educational Achievement as well as Karen Ripley and Prenicia E. Clifton from DCS. Focused on a cross-campus effort to help local governments, Ron Cramer Strategic Learning Technology Consulting (SLTC) and Kelly Conforti Rupp from UniverCity Alliance presented the “Advancing Equity and Sustainability throughout Dane County.” The poster featured UniverCity Year, a program where UW-Madison faculty, staff and students partner with local governments to find practical solutions to the community’s toughest challenges. As part of his role as a Senior Strategic Consultant for the Wisconsin School of Business, Ron worked with Professor Jaime Luque on the course Real Estate 420: Urban Regional Economics. Looking to provide a real world application for the course content, they connected with UniverCity Alliance to have students conduct a housing affordability assessment for the Dane County Board of Supervisors (DCBS). Students created reports on selected sites that included a cost analysis, design ideas, financing options, and other considerations that a potential developer might want to know. Students then presented their solutions to DCBS staff. Elsewhere in Union South’s Varsity Hall, DoIT AT project manager Nicole Olthafer joined Caitlin O’Brien from the Office of the Provost to answer questions about the Engage eText Pilot and the Student Digital Ecosystem. Both are Educational Innovation (EI) initiatives that DoIT AT and other campus partners like the Office of the Registrar contributes to. 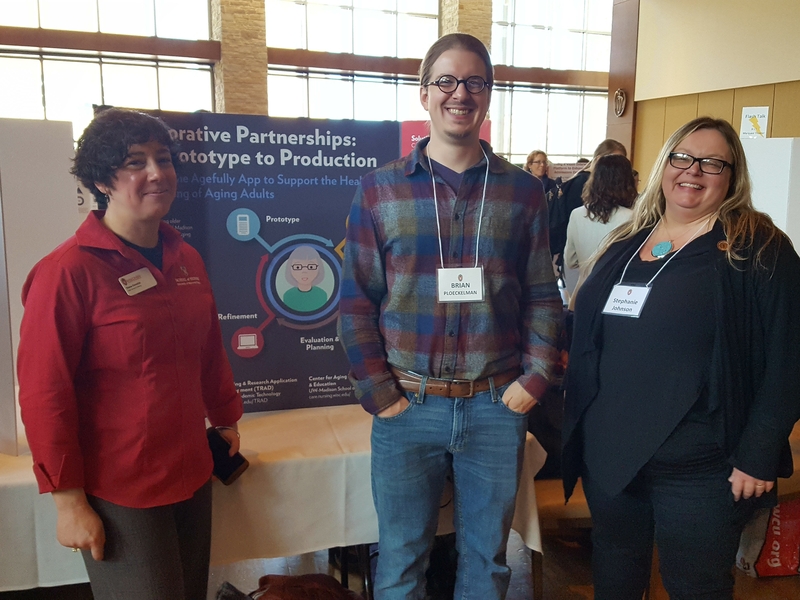 School of Nursing’s Diane Farsetta presents the “Collaborative Partnerships: From Prototype to Production” poster along with Brian Ploeckelman and Stephanie Johnson from Teaching & Research Application Development (TRAD). Karen Ripley and Sarah Stilp from the Division of Continuing Studies join Carrie Golden from Information Technology Academy to present the “One Online Application. Countless Pre-College Application” poster. Caitlin O’Brien (second from left) and Nicole Olthafer (left) engage with Showcase attendees about the Student Digital Ecosystem and this spring’s Engage eText Pilot. 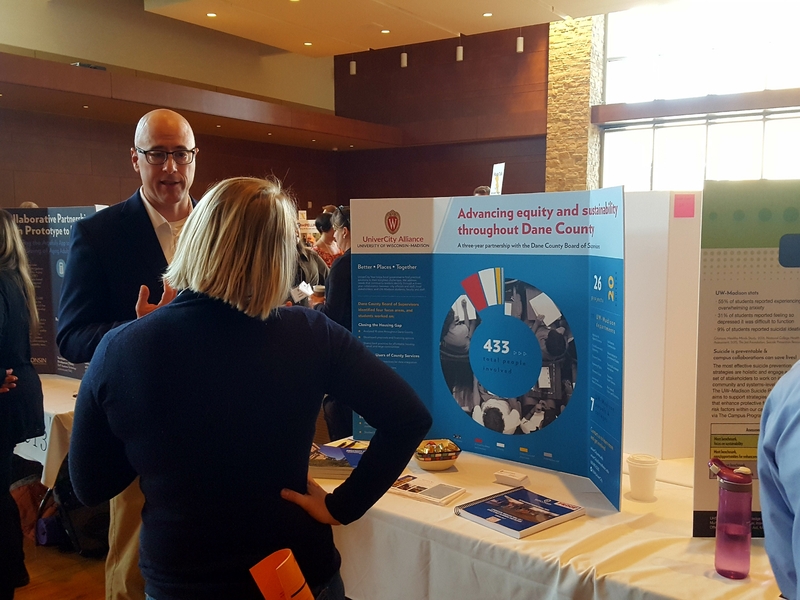 Strategic Learning Technology Consulting’s Ron Cramer answers questions about UniverCity Year, a program where UW-Madison faculty, staff and students partner with local governments to find practical solutions to the community’s toughest challenges.